They were cooks from humble origins. They set up their own businesses after working for bourgeois families in Lyon. The Mothers cooked simple and refined food. They used inferior cuts as they were in the habit of not throwing anything away. The Lyon mothers flourished during the inter-war period. 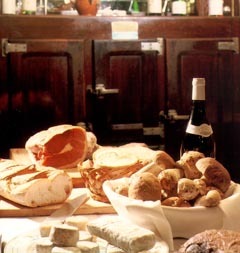 The impact of the war and the 1929 economic crisis were to change the face of Lyon’s cuisine. A lot of these cooks were dismissed from the homes where they worked. This is when they opened their own restaurants… much to our delight! Workers, celebrities and rich businessmen sat side by side at their tables, in a friendly atmosphere! Like for example Mère Fillioux, born in 1865, who was the first to gain a reputation. She worked as a cook for an insurer, after which she opened her own bistro. Her delicious volaille demi-deuil (truffled hen) made her famous. Mère Brazier is also an iconic figure. Born in 1895, she worked for a pasta manufacturer before learning her craft with… Mère Fillioux! Her first restaurant became Lyon’s most renowned. She opened a second one which trained none other than the great Paul Bocuse. Her name became legendary as she was the first woman to be awarded three Michelin stars for both her restaurants at the same time in 1933. Hats off! Have you heard of the Lyon Mothers? These iconic women are behind the creation of Lyon's bouchons (traditional restaurants)… and the city's culinary reputation! No, men did not call the shots at the time!